Gain mastery over your voice by understanding its dynamism, power potential and tonal quality. 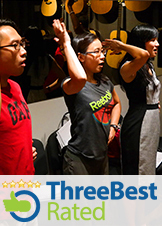 Go beyond technique & mere melodies as you develop ownership over your voice whilst communicating powerfully heartbeat of each song you sing. The Contemporary Voice Program™ is designed to equip you with the proper techniques to sing beautifully with your voice or to complement your keyboard and guitar playing ability. It is never too late to embark on this musical adventure…We will take you there.